A simple and striking fact, which is little-known and has astonished a number of folk in the EU institutions in Brussels: when Britain leaves the EU, it will become the EU’s largest export market. Bigger than the USA. Bigger than China. Some people ask whether it will be possible to negotiate a Free Trade Agreement with the EU when we leave. But with the EU scrabbling to set up FTAs with a host of countries around the world, it is inconceivable that they would not agree an FTA with their largest export customer — especially when that customer is also a major net customer. We import far more from the EU than they import from us. An FTA will benefit both sides, but arguably it will benefit them more than us. I was in the Philippines recently, and mentioned this fact to an official at the EU “Embassy”. He simply couldn’t believe it, so I dug our the figures. 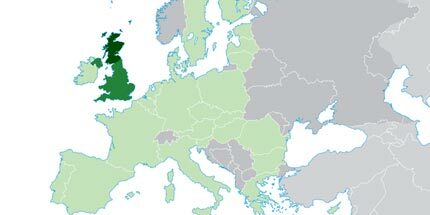 The UK represented over 12% of all €urozone exports. Far from being “isolated and marginalised”, an independent Britain will be a key trading partner of Europe. Roll on Independence Day! not surprising Germany is begging Scotland not to vote for E.U. withdrawal in the unlikely event of Britain having a future referendum! It was Nigel Farrage who pointed out the imminent arrival of the Romanians and Bulgarians. Now you are making a similar point. Actually I did know what you are saying already. The difference is the map and the figures carefully backed up by the websites. Well said – a conclusive piece of common sense (again). This is the line that we should take every time the pathetic howl about “3.5 million jobs are dependent upon our membership of the EU” is thrown into the debate. How many jobs are dependent upon £213bn worth of EU exports to the UK? I don’t recall any weeping and wailing about this potential disaster for EU jobs from Europhiles – I wonder why? The question that needs to be asked urgently is this one. The current FTA negotiations between the EU, US,Canada, Japan etc do they include a special clause to include a member state that subsequently leaves? i.e. UK. The same question in reverse should apply to the US & Canada just in case Texas or Quebec decides to go it alone. If not why not. Now you have spoilt another good political argument for them. Please do not confuse them with facts. With the fall of the UK pound on the stock markets it makes no difference if Britain stays or goes. This argument about dealing with India and China is silly as i deal with the world all day. I am Eu to the very core and love it,why because it makes me a bloody fortune. With the rise of the Euro many will spend on Valentine gifts from USA to Bombay from Rome to London click of coins rustle of notes.It is just the local businessman deals only in UK and the honest fact that many have lost heart and have forgotten how trade works or Britain would not be so weak to leave now UK is a sinking ship.Be guided by David Cameron or sell that car my boy you will not need it now.